A gang of thieves was caught on film carrying out a daring robbery which had them jumping on to a moving cargo truck, like a scene from a heist movie. 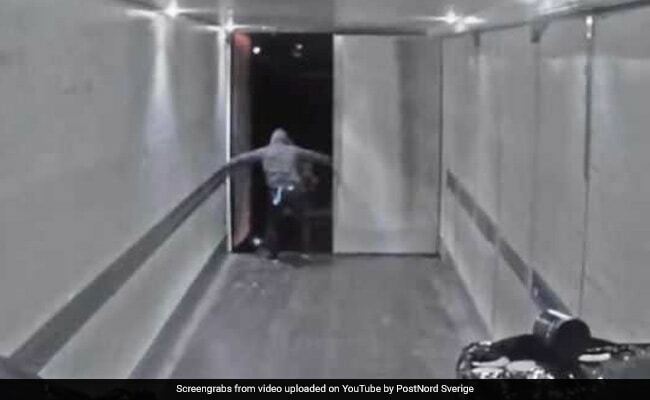 Swedish cargo company PostNord set up cameras inside one of their delivery trucks after they suspected goods were being stolen in transit between Stockholm and Goteborg. Their suspicion came true as they witnessed, through live feed, two thieves boarding their cargo truck which was moving at the speed of 80 km per hour. Surveillance video showed the two men climbing on to the moving truck from the bonnet of their car, similar to heists seen in reel life and then rummaging through cargo, which was filled with empty boxes as part of the plan. Empty-handed, the men tried to make their way back to their car but were arrested by cops who were waiting nearby. Their two accomplices were also arrested by police. Electronic goods, mainly computers and smartphones, worth 224,620 pounds had disappeared from the company's trucks, Daily Mail reported. The company then set up the trap in September to nab the thieves. "I had a theory, or a feeling in my stomach, that the thefts were carried out during the journey, but no one really believed me,' Alexis Larsson, the firm's Head of Security told a Swedish website. This isn't the first time thieves have taken inspiration from reel life. In August, a Romanian five-member gang in Netherlands stole iPhones worth nearly 6 million dollars from a moving vehicle.